Wed 15 Nov 2000: Neighbourhood meeting #1 at Community Montessori Preschool, 1946 East 19th Ave. 35 people attended. Available online: the agenda and three-page minutes. Wed 29 Nov 2000: Neighbourhood meeting #2 at Community Montessori Preschool, 1946 East 19th Ave. There seems to be no record of this meeting. Thu 7 Dec 2000: Kensington-Cedar Cottage CityPlan Committee Meeting. The CityPlan committee voted to request a moratorium on further development of 1456, 1458 and 1462 East 18th Avenue. Available online: the meeting minutes. Fri 22 Dec 2000: Letter sent to Mayor and City Council by Anne Roberts, Chair, KCC CityPlan Committee. The letter is available online. Jan 2001 (approx. ): Gibby’s Field one-page information sheet produced by Mavis Dixon. The information sheet is available online. Tue 10 Jan 2001: Mavis Dixon heard from Bruce Maitland, the Manager for Housing and Properties for the City. Mr. Maitland agreed to place a temporary moratorium on further residential development of the property. Thu 12 Jan 2001: Kensington-Cedar Cottage CityPlan Committee Meeting. Minutes are available online. Wed 30 Jan 2001: Neighbourhood meeting #3. Agenda items: 1. Update on interviews. 2. What else has to be done? 3. Video footage. 4. Presentation. A total of 50 people participated in the three neighbourhood meetings and 18 were organizing members or key liaison people, as of 10 Feb 2001. Feb 2001: “How Gibby’s Field could look: View from Community Montessori Preschool.” Colour drawing produced by artist Helen Lambourne. A photograph of the drawing is available online. Wed 7 Feb 2001: The Gibby’s Field Group met with Mark Vulliamy, Manager of Park Planning and Research, Park Board. Sat 10 Feb 2001: Visit to Gibby’s Field by Park Board Commissioner Clarence Hansen. A thank you e-mail from Mavis Dixon is available online. 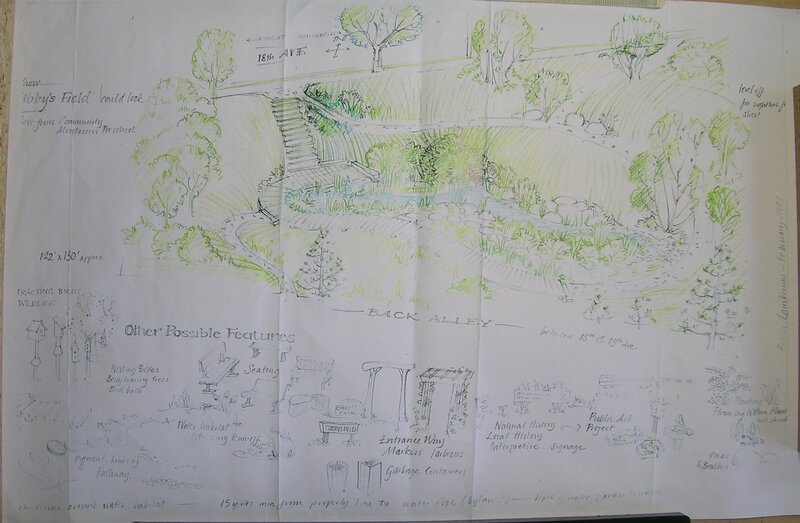 Thu 15 Feb 2001: “Gibby’s Field: Historical Research Plan” prepared by historian Meg Stanley. Sat 29 Sep 2001: Seven-page report, “Gibby’s Field Final Research Report,” prepared for Gibby’s Field Group by Arn Keeling. This report is available online in HTML or PDF format. Thu 13 Dec 2001: Interview conducted by Jenny McClean with Doug and Lydia Grant, and later transcribed by Jenny McClean. September 2006: The Gibby’s Field Subcommittee begins its work, building on the work of the Gibby’s Field Group.